To get to know the main tourist spots and historical monuments, a very touristy but easy and comfortable option is to try one of the 4 different tourist bus options in Zaragoza. 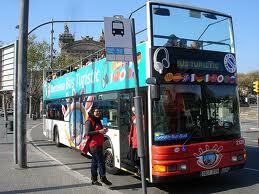 This is an open-top, double decker bus that takes you to lots of the interesting tourist sites and monuments. You can hear explanations in your language and get on and off all day for one set price. There are 2 routes to choose from; Expo 2008 - Aljafería - Estación Zaragoza Delicias, or Expo 2008 - Aljaféria - Parque Grande. You can get your ticket on the bus itself, or at many hotels, kiosks and in Tourist information offices. One ticket costs €6 and kids under 5 are free. You also get lots of offers and discounts at museums, and shops included in the price of your ticket. This bus is like the normal tourist bus, but has no stops and has different historical characters getting on and off, telling legends and anecdotes about old Zaragoza. Tickets are €12, kids under 5 are free. Leaves from Avda César Augusto, just in front of the Roman walls. Also like the main tourist bus, but this time with activities directed at kids. There are activities for children including; games and songs and guides dressed in Roman costumes. Book your tickets ahead of time at the Tourist Info office in Plaza Pilar, at a cost of €4.20. 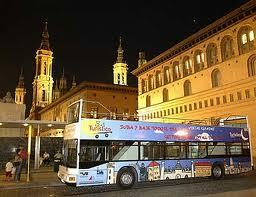 This bus runs at night and focuses on showing the old Iberian, Roman, Muslim and Christian side of Zaragoza. It tours lit-up ruins, churches, Palaces and Villas. And also takes you to some typical Zaragoza Tapas bars and trendy pubs along the way. Departs from Don Jaime I street.